How very lush your necklace is Lesley! Love it! I think you absolutely captured "abundance"! I can see you didn't let a little thing like a broken leg slow you down! What a gorgeous design. I love this soft, muted look. What a beauty! Oh Leslie!!!!! I am blown away! I love your necklace! I love the color palette and everything about it! Leslie your necklace is gorgeous. Your leaf connector glows against the muted tones of Kristen's beads. Combined with those matte beads and touches of bronze and gold – just perfection! Lovely! 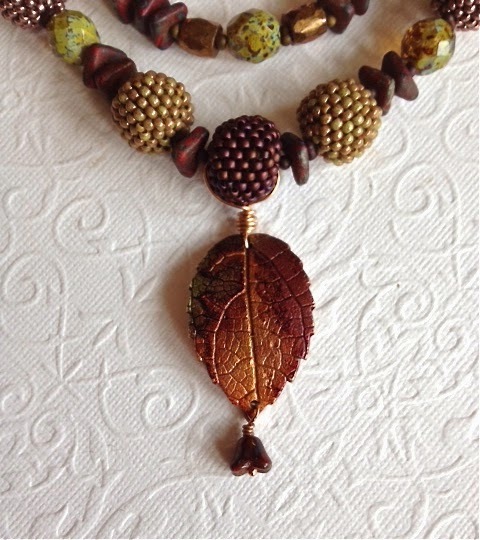 These beads work so nicely with the leaf component–something seedlike and natural about them that makes them coordinate perfectly. I love how the strands of peanut beads at the end echo the nubbly texture of the beaded beads. Lesley I love the color palette and hedgerow fruits……..of course! When I saw these components in the giveaway, I knew they reminded me of something but I just could not put my finger on what it was. You nailed it! This is a gorgeous piece! Ooo, that's stunning! 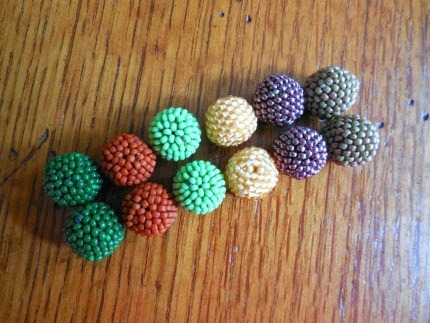 A glut of beautiful beads. WOW! What a gorgeous necklace! I love everything about it! Smart trade! I love your inspiration of the hedge balls. As a kid it was my job to pick them up so dad could mow. As a grownup I love to pair them with pumpkins. Your necklace is just gorgeous. I love all the different elements you put into this piece! How beautiful…and so earthy! Great job. This necklace is beautiful and does show abundance! Absolutely beautiful! I am in such an earring making rut these days, this makes me want to create a necklace! Abundance and harvest. Like seed pods ready to burst. I love that you used more of Kristen's beads – it really called attention to them, and created lusciousness.